Planned to have a 2D thing, but ended up with just a 2 so far. No ideas past this... hasn't someone done this already? Ugh, I was gonna add all the Ink people to the userlist... but it's too much work. Just say something if you want to mess with it. Another idea? Something like a lithograph or something. That's a better looking d (yes that's a d on its side). Eh, I liked just the "2" better. The style looks awesome, but I'd never guess that was a 'd'. Really cool so far. About time someone made something new on this board. Hurray. This is nice. Btw, all Ink people should be able to change whatever now. Yes! 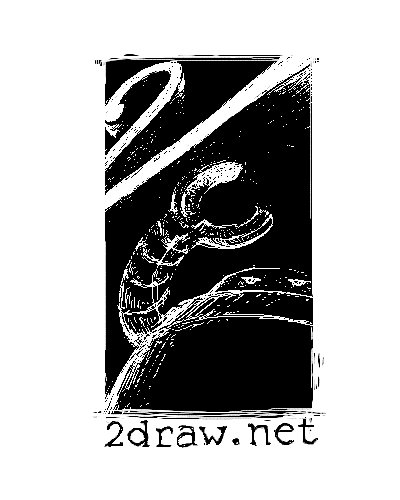 He is surely the mascot of 2draw. From the thumbnail, his arm looks like shrimp. rock, i love it. i'd buy it and wear it proudly. or clean my toilet with it. either way. Yay, shrimp arm. Someone fix it so it's not a shrimp. I think I like this one the best of the potential 2-draw shirt graphics I've seen. It really does look like pen and ink. I love Zoraw. This would be a pretty cool shirt, I mean, I'd buy it (if I had money). that composition looks nice, tho I still cant find the "d"..
(i know where you can get cheaper blank t-shirts,the more the cheaper;"Dharma Trading.com",but they don't do the printing.but lotsa kinds, sizes,maybe black. )cheap for just one, also(this is not an ad) yeah, do it.